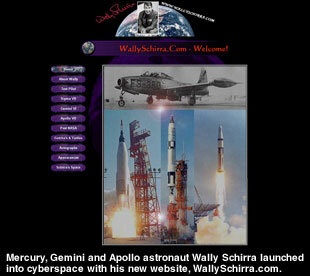 collectSPACE - news - "Schirra's (Cyber) Space"
March 15, 2005 -- Wally Schirra, the original astronaut with the 'right stuff' to fly all three of the United States' early spacecraft, has recently launched his first mission into cyberspace: the debut of WallySchirra.com. "I was told having a website would help me [handle my] autographs and speeches," explained Schirra in a phone interview with collectSPACE. "I have yet to figure out why my life story needs to be on the web, but they tell me that's needed." Schirra's story, which he shared on the pages of his 1988 book Schirra's Space, is that of a Navy test pilot turned all-American hero as one of the nation's first astronauts. He commanded the third orbital Mercury flight Sigma 7 for nine hours and six orbits before performing the first pin- point landing in the Pacific, a mere 9,000 yards from the recovery vessel. Three years later in 1965, Schirra was back in space, this time accompanied by Tom Stafford aboard the two-seater Gemini 6 spacecraft. When the flight's target vehicle was lost during launch, the mission was repurposed to perform the first space rendezvous between manned vehicles. It was a crucial milestone toward the goal of a lunar landing. Schirra's third and final mission was even more important. Following the tragic loss of three astronauts - including Schirra's Mercury classmate Virgil 'Gus' Grissom - during a pad fire, NASA overhauled the Apollo spacecraft. The program's first 'return to flight' fell to Schirra's command with Walt Cunningham and Donn Eisele. Despite suffering from a cold he developed over the 11 day, 1968 mission, Schirra and his crew put the "Block 2" Command Module through its paces, returning NASA on a path to the Moon. Today, as the space agency prepares Shuttle Discovery for its return to flight after the loss of Columbia in 2003, as well as plot a new course back to the Moon, Schirra's story is once again the stuff of headlines, which may help explain the unexpected popularity of his new website. Says Schirra of his moniker's dotcom traffic, "I was quite surprised; over 100,000 visitors they tell me." The "they" Schirra speaks of is primarily his webmaster Tracy Kornfeld, a Connecticut-based website developer who builds intricate models of spacecraft in his free time. "I met Tracy at an autograph show and we became fast friends. He had built a model of the Mercury capsule with its launch tower which I fell in love with." "He suggested I needed a website and that's how we got started," tells Schirra. From there, Kornfeld set about gathering content for the site, including biographical data and videos, as well as a growing collection of anecdotes detailing the "Gotcha's" - practical jokes - Schirra infamously pulled on his friends, colleagues and crewmates. "There are many more [Gotcha's] to share," says Schirra. "[Alan] Shepard and I swapped [Gotcha's] and who was on the winning and losing end. I will probably add more to the site as time goes on." "Like the one about Shepard, who was driving down to the Cape in a Corvette. Shepard was going from Orlando to Cocoa Beach when he had a traffic light race with a pretty young girl in a Triumph, a TR3. He got a [speeding] ticket and not long after we heard it on the radio news. So we went down to Cocoa Beach where we knew Shepard was going to arrive and got a TR3 decal to put on his car, like fighter pilots decorate their cockpits with the insignia of a downed enemy. That's the [type] of games we played." Schirra says he will let readers decide the future direction of the website, and feedback has already begun. "Many of the astronauts' wives have asked why Jo [my wife] isn't featured on there and I have to work on that. We have been together 59 years, we're in a rut," Schirra laughs. "She likes to say I was away half the time." Also coming to WallySchirra.com is information about an upcoming book Schirra and Ed Buckbee have written. "Its going to be a fun book. Ed was number one next to [rocket pioneer Wernher] von Braun for security and special events. He knew von Braun better than any of us. We all fell in love with von Braun," recalls Schirra. "Ed just showed me a very interesting document: how von Braun made a presentation to NASA two weeks after the moon landing about how to go to Mars. We will refer to it in The Real Space Cowboys (Apogee Books, 2005) and if we can, possibly include it on a CD [with the book]. "I've always felt that von Braun has never gotten enough credit. In my book Schirra's Space, I describe how he was adamant to first have an Earth orbit station to go the Moon and then return to, avoiding having to go through a monstrous reentry. We probably wouldn't have achieved the win over the Russians had we used that approach but can you imagine the space station we would have today? "I've always thought 'space station' is a great name. It should be like a gas station where we go for service and supplies before heading further out." Schirra's opinions on the future do not stop at the station. Speaking of the President's proposed Vision for Space Exploration, he said, "I don't particularly go along with going to Moon first to build a launch pad to go to Mars. We should go [to Mars] from Earth orbit. Once you are in Earth orbit all the work is done. They say we need to go to the Moon to practice going to Mars. We have already been to the Moon; we've already practiced." "Its a situation of we've been there and done that. Back [after Apollo 7], darn right I wanted to go [to the Moon]. Today, I say if I were offered a flight like John Glenn [on the shuttle], I am not that old," chuckled Schirra, 82, who celebrated a birthday this past Saturday. "Seriously, if I were to go on a flight today I would need three years to train, as I would want to command, not just ride as a passenger." Asked if he has any advice for Eileen Collins, STS-114 commander, Schirra concluded, "Being commander [of Apollo 7] was a real responsibility. I went from 'fun Wally' to 'Let's Go Wally'. NASA recognized I was one of the members of the first 'return to flight' after Apollo 1 and in turn, I encouraged Rick Hauck [STS-26 commander], who I inducted into the Astronaut Hall Fame." "I have been asked by NASA to [offer advice to the 114 crew] and once they have a date set and know that they are going forward, I am going to call Eileen Collins. I'll tell her to hang in there, follow the mission rules and don't let anyone change the flight plans."